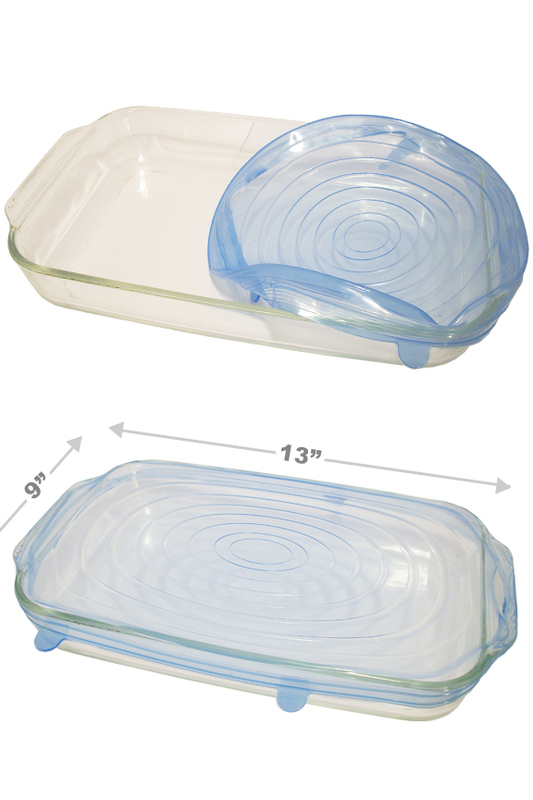 A deluxe set of stretchy storage lids to prepare you for covering any container in your kitchen. This seven piece set combines our regular set and the extra large lid into one money saving combo. You can order them separately if you only want one or the other, but when purchasing together in this set, you'll pay the lowest price possible. Save a soda without losing the fizz, keep half a can of pet food for the next day, cover leftovers from dinner, transport brownies and cakes without damage, or preserve fresh fruit by stretching a lid over the uneaten half. These handy covers can stand in whenever you would normally use plastic wrap, but they provide a better seal, create a stronger lid, and are totally washable and reusable for years of service. Add in the fact that they are microwave, oven and freezer safe, and you have an incredibly versatile storage device and cover for all sorts of tasks. Use as a splatter guard in the microwave, cover casseroles in the oven, or store foods in an airtight chamber for long term storage in your freezer. They are simple to use, and they adapt to any shape or size container you have. 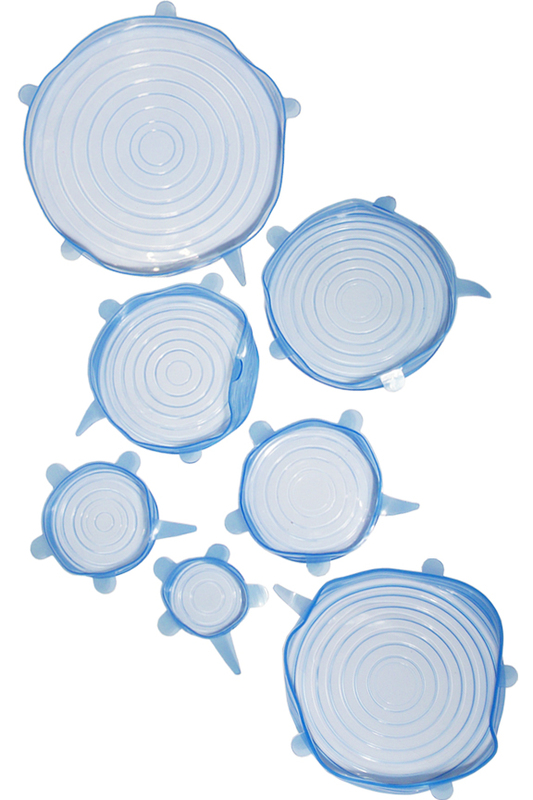 Despite their circular shape, you can easily seal round, square, or rectangular dishes with the same great results. Thanks to the durable material, they also provide a sturdy shelf once in place, so you can easily stack stuff in your fridge to conserve space. Just pull to stretch, and secure in place. The clingy material grips the edges of glass, metal, plastic and other materials, and added ridges lock the lid in place, and prevent slipping. Each one is made from a pure silicone material that is totally food safe, and each size will adapt to fit a variety of containers. With the selection available in this set, you'll be prepared to cover anything from a single can of beans to a party size taco dip in a 13" x 9" pan. Stop struggling with plastic film and foil, and don't toss stuff out after a single use. These reusable lids work better than the disposable options they will replace, and they will save you money when you use them instead. Quickly cover any container with a sturdy lid, and preserve the food inside thanks to the airtight seal. 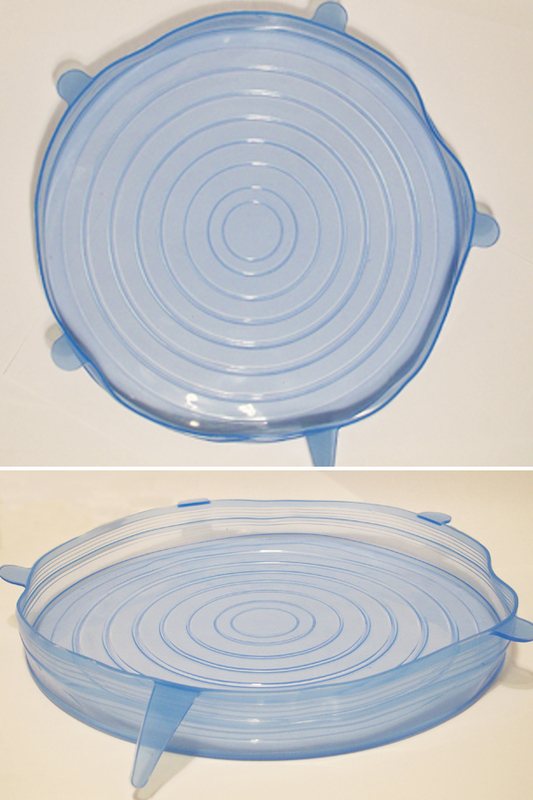 You can even use them instead of standard lids to replace one that is lost, or to eliminate the annoyance caused when you can't find the right one. Imagine never running out of wrap, never searching for lost lids, and never throwing away wads of garbage after you pull saved food from the fridge. This amazing set is perfect for any kitchen, and they are guaranteed to work. Save time, save money and save the environment when you switch to this eco-friendly food storage option. Sizes Included (1) 9.5", (1) 8.25", (1) 6.75", (1) 5.75", (1) 5.15", (1) 3.95" & (1) 2.75"
One lid for anything you need to cover. Round in shape, but they work on any geometry in your cupboard. Quickly create an airtight lid, and then reuse over and over again. Order Yours Today. Haven't gotten to use mine yet(had shoulder surgery) but I bought them for my daughter in law and my two sisters and they love them. I really am thinking these would make a great Christmas gift. Brilliant Idea, so useful. I've lost the tops on a few containers and this product has been priceless in replacing those tops since you cannot buy them separate from the containers. I have found they also keeps the contents fresher longer. Love it. 10 stars out of 5. A little hard to stretch and stick to containers. I haven't used the product very much, but the times I have used it, I was very effective. It seems to be what it is advertised as. Torn on this review, the item works, but not particularly well. The gel character of the product allows it to stretch quite well, but it does not grip surfaces well. Any moisture or grease on glass and it slips off, or is hard to get to grip at all to stretch to the surface. If the silicone and the glass are perfectly dry and clean it works OK. Works best on round surfaces and does not actually "fit any shape". Also limited to small containers as even the largest does not cover good sized containers. Would rate it 5 out of 10. Are these covers BPA free? What size fits a dog food can? For pet food, use the smallest size lid.